I’ve picked up the PonPon Stampi Eyebrow Stamp Pen from Watsons awhile back as the idea of an eyebrow stamp is really interesting. We have seen Eyebrow Powder Stamps around on Youtube but this is the first time I’ve seen an eyebrow liquid stamp pen. The PonPon Stampi kit comes with the eyebrow liquid pen and two sets of stencils for the brows. We have the Natural Style and the Mode Style. The Mode style stencil is thicker at the start with a soft squarish edge while the Natural style is thinner and a rounder, softer edge. I would say the stencils are a little short for my brows though. The eyebrow liquid pen has got a cushion tip and you have to twist to get the product out. Eyebrows in 3 seconds? Really? I would say not really. The stamping is quite a quick process but this is not a product that you can just stamp and go. You do have to clean it up and touch up before the brows look finished. Plus, as it’s a liquid product, it smudges when you remove the stencil no matter how careful you are. Well, unless you have the patience to wait for the liquid to dry to powder before removing it. But that definitely takes more than 3 seconds. You probably need at least 15 seconds for the product to set in and by then it will be difficult to clean it up. PonPon Stampi Stamp On Brows Worth it or not? Retailing for $23.90, I don’t think this is a product that makes drawing your eyebrows an easier job. Rather, I feel that it does quite the opposite. First, both stencil styles don’t really suit me as they are a little short. Second, it is messy. You will need to clean it up for it to look decent. The idea behind the PonPon Stampi Stamp On Brows is good but the end results are not exactly ideal. I’ll still use the Eyebrow liquid pen with an angled brush to draw on my brows as I feel that it’s actually quite pigmented. It does look nice when dry but do note that the product is not waterproof. This can be washed off easily with water. It’s definitely a fun product to try, but not an effective one. There are many eyebrow products out there which are better. I would think an eyebrow tattoo gel works better than a stamp on brow kit. Hope you like this review! Althea has put together a Smart Beauty Tools box which includes items from Skincare, Beauty Tools to Makeup to help one to create a flawless look! Let’s take a look at the items in the box! The first step to flawless skin is oil-free skin and clean pores! The Black Block soap and Pore Cleansing brush from BB& Soap provide you with just that! The Pore Cleansing brush fine bristles will get deep into your pore to clear out the impurities while the Black Block with Charcoal extracts helps to leave your skin fresh and oil free! The Pobling Mini Ion applicator helps your skin to absorb your skincare products more efficiently with vibrating motions. I love using this for under the eyes with a gel eye cream which doubles up as an eye massage! The COC Pro Skin Adhering brush is a dense toothbrush shaped oval brush which helps to buff the product into your skin. I prefer to use this for targetted areas rather than a foundation brush as it’s quite small. The brush is very dense and soft at the same time which makes it great to blend the product out. IT’s Skin It’s Top Professional Touch Finish Correction Foundation is a medium to high coverage foundation which leaves a semi-matte finish. A beauty blender lookalike, It’s My Magic Sponge did a good job in blending the foundation into skin. The tip is not skinny enough to reach into corners though. An eyelash curler with a comb that is supposed to help prevent any clumping. Only useful if you curl your lashes after mascara. If not, it works like any other curler. The Pink Heart brush from COC which is a multi-purpose brush that can be used for powder, blush and contour. I like how fluffy it is and how travel-friendly it is due to its short handle! Get Ready With Me Ft Althea Smart Beauty Tools! Althea Box provides free shipping with their best price policy! Also, do not worry about the authenticity of the products as they have an Authentic Guarantee! The Smart Beauty Tool Box is currently out of stock but there are so much more other quality products on the Althea site so shop away! Makeup Brushes: How Often Do You Wash Them? It’s not difficult to guess that the process of washing our makeup brushes is a chore that no one likes. And how tempting it is to just keep using the makeup brushes without washing them for an extended period of time. Imagine the amount of product built up in the brushes and the amount of bacteria accumulated in the brushes. Now, imagine that amount of bacteria being transferred back to your skin each and every single time you use it. I would say that washing our brushes is part of a skincare routine! Having clean brushes means no bacteria which also means minimizing the chance of infection and getting breakouts. And this ultimately leads to better skin! Having clean brushes also makes the application of makeup smoother! Plus you don’t want to have murky colours just because you didn’t clean the brushes properly! The highly raved $2 Daiso Sponge Detergent! Always out of stock at the stores. I’ve previously stocked up to 5 bottles and is left with 2 now! This is hands down the best cleanser out there for your sponges and puffs and beauty blenders! I used to use this for brushes and it cleans them out just as well. MUFE Instant Brush Cleanser which I swear by! I used this to cleanse my brushes after every client I made up while on a job. Personally, I used this once every 2 days of makeup application to clean my brushes. This cleanser takes off the most stubborn stains! Probably one of my best buys ever. The Makeup Store Brush Cleansing Soap. I bought it at $26 around 2 years ago and used it once every two months for a deep cleansing session. It’s probably left with 30% of the product as the middle part is going to hit “pan’ soon. Highly recommended as it’s just so convenient! You just have to swirl your brushes on the soap and see all the makeup runs out! I’ve gotten this BrushEgg Dupe sometime back from a flea and it has since up my brush cleaning regime by a notch! Instead of just swirling my brushes in the soap, I’ll swirl it on the ridges of the BrushEgg to get the stubborn makeup, especially foundation off the bristles of the brushes. The friction definitely gave my brushes a deeper cleansing! So How Often Do You Wash Your Brushes? I gave my brushes a quick cleanse with the instant cleanser every 2 days and I do a deep cleanse every 2 months. Used to have a monthly deep cleanse before I started using an instant cleanser. How about you? How often do you cleanse your brushes? If you are not doing so for more than 2 months, you better start washing those brushes before you use them again! I believed that some of you have heard of the ReFa Carat and other devices under the same series. The main company behind this beauty device, MTG have launch in Singapore few months back, distributing the product line under their own. The ReFa is an award winning beauty device and is very popular in Japan. The star product of the ReFa series will be the ReFa CARAT. This device got its inspiration from the kneading techniques from the professional aestheticians. It is designed to allow users to have the same feeling of being massaged by a human with the firm kneads from the 2 rollers. It is mainly for use on the face but can be also be used on the body. There’s a ReFa Body device too, specially designed to be use on the body only. I volunteered myself for the showcase of how using the ReFa Carat can produce almost instant results. 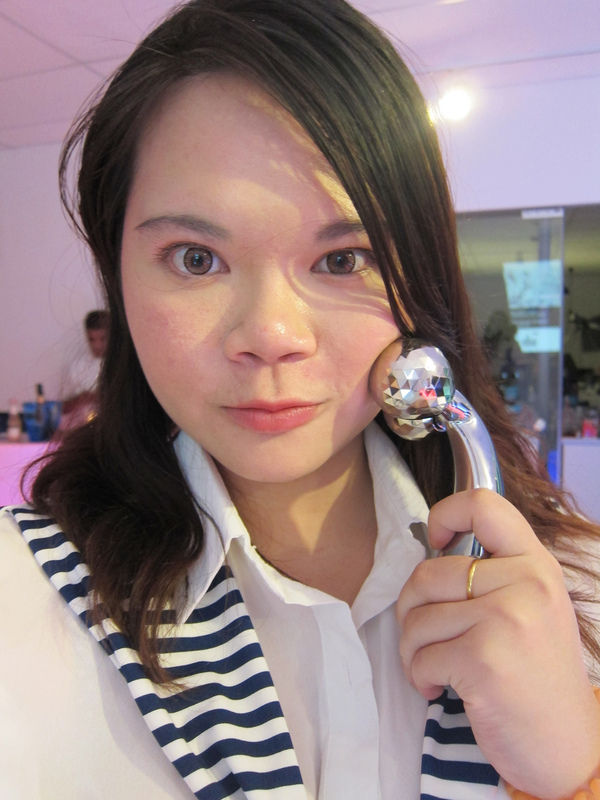 When the ReFa Carat is being used on me, I felt as if I’m massaged by hand and not the device. Using the device on the right areas can help with lymphatic drainage. 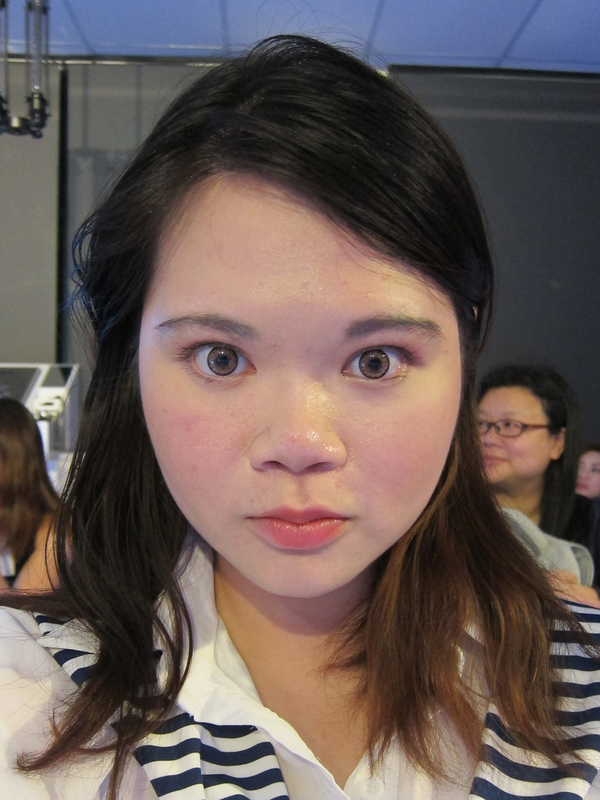 I took a photo of my face immediately after the demonstration. Did you notice any difference? 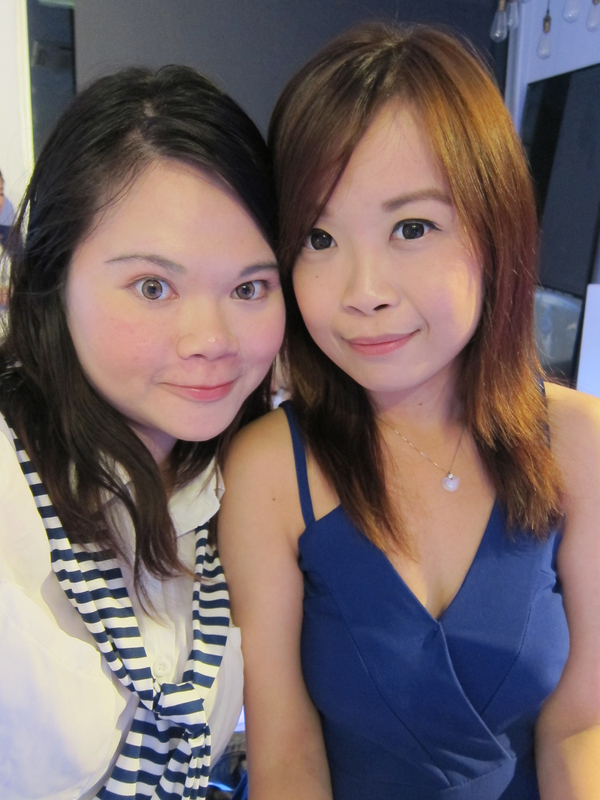 If you look closely, the right side of my face(left on the photo you’re looking at) is slightly firmer and slimmer. The ReFa Carat produce results almost instantly. However, I won’t say the results are lasting. But I believed if you use the device everyday, it will definitely give you the firm and lifted look everyday. And it does feel good to be using the ReFa Carat to massage the face after a long day. Here’s a photo with Verlyn! Trying the ReFa Carat on my own. It’s not that difficult to use, gentle rolling motions can produce the firm kneads due to the design. Did I also mentioned that the ReFa Carat works on Solar Power? No need to worry about the battery life! As long as there is light, you can roll your way to a smaller face! Special promotion for my readers. Enjoy a 10% e-discount with the promo code “MTGjoyce” when shopping at http://www.mtg-sg.com/en/ ! Check out this video on the ReFa Carat! Have you heard of SkinMiso? It’s Korean skincare brand that focuses on pore problems and also exfoliation of dead skin cells. The kind people at Urban Hunter, distributor of SkinMiso have kindly provided me a complete set of the SkinMiso Pore Beauty Nose Pack plus Comedo Remover for review. Now, let me introduce to you the SkinMiso Pore Beauty Nose Pack, just 3 simple steps to get rid of the strawberry nose that most of us have. Step 1 and 2 are nose packs of different purposes. Step 1 will be the pack that will force the black and white heads out. Then we remove the impurities with either a cotton bud or the SkinMiso Comedo Remover. Step 2 helps in calming the skin and contracts the pores. Step 3 is the Pore Beauty Silky Essence which helps smooth out the pores. I really liked how the smooth my nose is after using all 3 steps. The essence will make it velvety smooth! Here’s me trying out the nose pack. Blackheads are always there on my nose and I’ve a lot. The battle with blackheads is a constant one unlike acne. I’ve tried many ways and products previously to get rid of the blackheads. SkinMiso is by far, the most efficient product I’ve tried. Let me show you. It’s a little gross though. But the photo below shows the amount of gunk I managed to remove with first use of the nose pack. The SkinMiso Comedo Remover comes in a cover as below which makes it more hygienic when storing it. It also have two ends to it, a wider and a narrower for the curves around the nose. The photo above shows the narrower end. SkinMiso Pore Beauty Nose Pack is available at most Watsons stores and retails for $28.90. 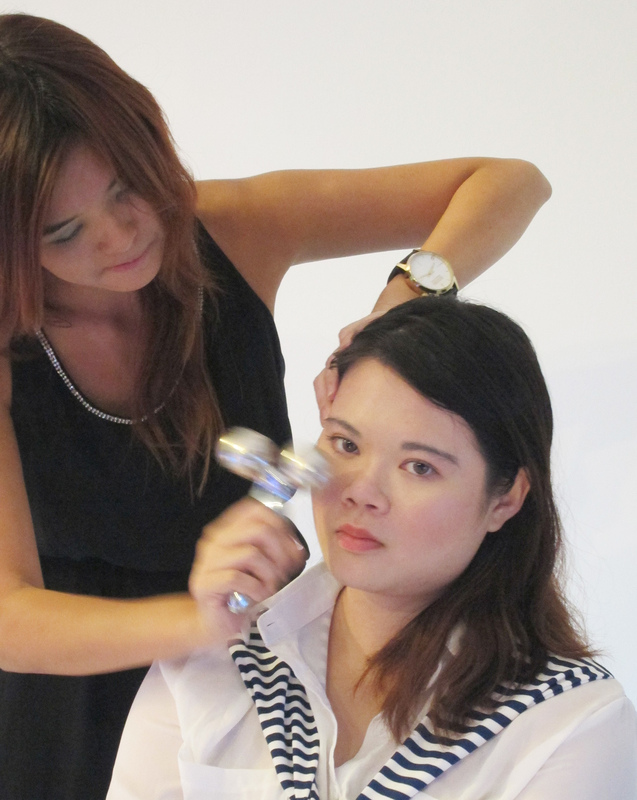 The Comedo Remover is only available exclusively at Bellabox.sg. Buy the complete set at Bellabox to get a 15% savings off the complete set! For those who have concerns of a strawberry nose, try out SkinMiso Pore Beauty Nose Pack today! I rate it a 4/5 rating! And if you ask if the Comedo Remover is worth getting? I would say yes as the quality is really good. I think it has to do with the thickness of the rim, some of the ones out there are too thin and it hurts when you apply pressure to the skin with it. The SkinMiso one is just nice for me, I don’t really feel pain when I’m applying pressure with it during the removing process. Let’s get rid of those Strawberry nose with SkinMiso today!